Drawings will be accepted through June 16, 2017, with the grand finale held on July 1, 2017 at the El Naranjo Turtle Camp in Peñita de Jaltemba, Compostela. 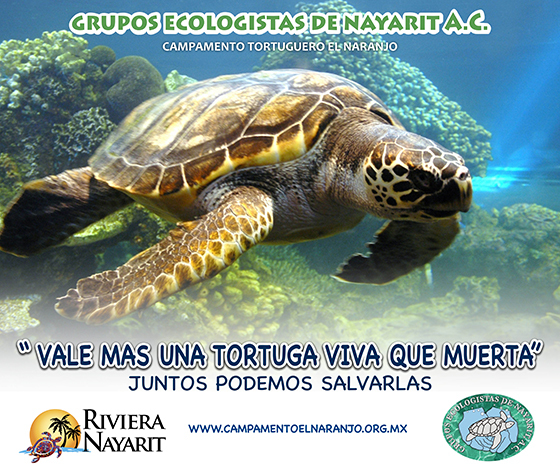 Grupos Ecologistas de Nayarit A.C. are extending an invitation to their 5th “Save the Sea Turtle” Drawing Contest, open to boys and girls attending elementary schools in the region. The objective is to encourage the preservation of the species, especially the sea turtle, while developing the younger generation’s artistic and social values. There are two categories for participants: one for children in first through third grades, and another for those in fourth through sixth grades. All drawings must be on letter-sized paper (bond paper, pearlescent paper, construction paper or poster board), using any technique (pencil, colors, crayons, watercolors, oil paints, magic markers, etc. ); tracing is not allowed and neither is the use of other materials such as glitter, stones, seeds, stickers, beads, etc. It’s important to add the name, age, telephone number, postal address, grade and school of the artist on the back of the drawing. The deadline for entries is June 16, 2017. Drawings can be turned in at Kaffe Haus Garden and Farmacia San Felipe in Tepic, Pinturas Berel de Mezcales in Puerto Vallarta, as well as the Pirata FM offices at Plaza Caracol. Schools can also collect the drawings from their students and contact the organizers via email at ricardovallarta@prodigy.net.mx. The grand finale will be held on July 1, 2017 at 4 p.m. at the El Naranjo Turtle Camp facilities in Peñita de Jaltemba, Compostela. There are over 20 prizes being offered to the winners by hotels, restaurants and amusement parks. For more information about the open call, the prizes and the results please visit: http://www.campamentoelnaranjo.org.mx/.